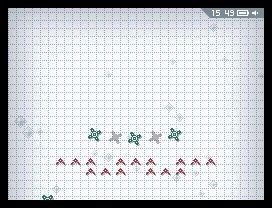 Starship Defense, from developer Q-Games, was released on the DSiWare platform in early 2010, and unfortunately I missed out on it. Yep, I was still rockin’ my DS fatty all the way up until the release of the 3DS, a situation that I rarely regretted until the DSi and DSiWare came along, but even then, I couldn’t justify buying a whole new model just to get my hands on a few downloadable games. Now I know that many of you think that I am insane for holding onto the original DS model for so long, but I also know that many of you never bought the DSi, and stuck with your fancy Lites and XLs instead. This has created an unfortunate scenario where a lot of great DSiWare titles have gone unplayed by Nintendo fans who may otherwise have given them a shot, due mainly to timing and circumstances. It is now a year and a half into the life cycle of the 3DS (which can, of course, play DSiWare games), and we no longer have an excuse. Let me just get this out of the way now: Starship Defense is a tower defense game. That’s right, tower defense, a genre that quickly became watered down with too many titles, much of them having so little to add beyond some core gimmick, that the incoming flood nearly washed away my interest in the genre, as I’m sure it did for many of you. I think many people would find it easier to buy another rhythm game *gasp*, than a tower defense game at this point. I wouldn’t blame you for not wanting to give yet another tower defense title a shot (even if it did technically release before the genre became such a pariah.) 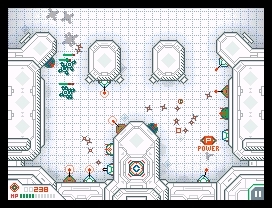 But let me make the case for Starship Defense anyway, because, although it lacks in the way of the flashy, over-the-top gimmicks that pop up in many other tower defense titles, it contains something that few others have: a core depth and balance that just plain works. And this is probably no surprise to fans of Q-Games, whom, among other things, have etched out their fanbase on both PSN (the PixelJunk series) and DSiWare (Trajectile, X-Scape, etc.) by consistently delivering high-quality games on these platforms. If you are unfamiliar with the tower defense genre, it is basically a more straightforward version of the real-time strategy genre. You generally have to defend yourself from wave after wave of enemies who progress in predetermined patterns by placing defense “towers” in various locations, while modifying your towers on the fly to defend yourself against the advancing foes. Starship Defense doesn’t break away from this formula in any significant way, unless you count the shift from land and towers to space and spaceship turrets as significant. The space theme may not really change much at the gameplay level, but it does lend a breath of fresh air on the surface to a somewhat stale genre, and it does affect the layouts of the stages in some minor ways. There really isn’t too much to say about the graphics and sounds of Starship Defense, which seem to focus more on function over fashion. Graphically, Q-Games went with a sort of low-key style, using a palette that consists mostly of white with a bit of color mixed in: a somewhat odd choice for a game set in space (which we usually think of as a black void), but it helps keeps the action clean. The music and sound effects are similarly low-key, with a sort of semi-dashing spacefaring feel, although they didn’t really stand out for me in any significant way. Each stage takes place with the enemy waves lining up on the top screen before dropping down on the bottom screen, which will be populated with various ship formations for you to utilize in your defense. Starship Defense is controlled exclusively using the touch screen, and this works very well for the tower defense genre, which often requires you to jump quickly from one part of the screen to another and make quick adjustments. Most of the selections you will make will start off with you touching the [C] icon on your mothership to bring up the control panel, where you can then select one of your various weapons, and drag it around the screen and drop it into one of the available weapon slots on one of your ships. There are some times when this is not quite as intuitive as it could be, and if you remove your stylus from the screen for even an instant your selection will be lost, and you will have to go back to the [C] icon and select again, which is a bit frustrating in a real-time game where every moment can count. Still, for the most part, the controls are workable and will do what you need them to do. Are you beginning to see a pattern in the color palette? The core set of weapons at your disposal is a bit limited next to some other tower defense games (including Q-Games’ own PixelJunk Monsters), but I’m not really sure that I see this as a negative. 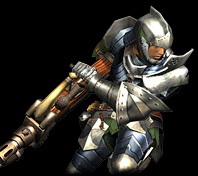 Each weapon has its own strengths and weaknesses, whether it be a powerful rocket launcher with a short range, a quick gatling gun with weak power, etc. 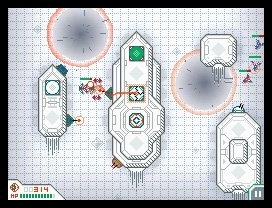 Furthermore, enemies can come in either normal or stealth variety, and only stealth weapons can attack stealth enemies, which adds another level to the strategy. Starship Defense takes this limited weapon set (which is slowly unveiled through the course of the game) and uses it to create a well balanced combat system, without too much excess fluff. Whenever you defeat an enemy, they will drop energy orbs, which you can collect simply by moving your stylus over them, as well as power-ups that you can use on your weapons. The energy orbs will primarily be used to purchase your weapons, but you can also exchange them for crystals, which have a variety of uses, including unlocking “advanced” and “science” weapons each round, upping your energy orb multiplier, and using SOS cards (obtained at the end of each stage), among other things. The SOS cards come in many forms, from cards that can add health or energy to your reserves, to cards that can call in a bounty hunter to help you in your defense. These additional options may seem minor, but they combine with the core weapon system to create a simple yet balanced tower defense game that really makes you think about the best usage of your resources. There are 30 stages in Starship Defense, which you progress through in a fairly linear path, although at times your path branches and you have a choice of which stage to play next. You can replay any stage whenever you like, which will help you to acquire more cards SOS cards and “perfects” ( completing a stage without letting any enemy units escape.) Occasionally there will be a gate on the map that requires you to have obtained a certain amount of perfect to pass. This initially worried me, as a large part of what kept me from finishing all of the stages in Q-Games’ previous tower defense game, PixelJunk Monsters, is that at a certain point it requires you to get perfects on all previous stages to unlock the last set of stages, which is a very overwhelming task (I believe that this may have been fixed since with a patch?) Starship Defense sets the bar a bit lower, however, only requiring you to get perfects on some of the stages leading up to a gate, and often by the time I got to a gate I already had the required amount of perfects, or was close enough that it wasn’t a huge hassle to go back and earn a few more. Although I definitely enjoyed the game overall, there are some areas that I feel were weaker than others. I already mentioned that the controls are not always ideal, and the graphics and sounds don’t really stand out much. I also feel like the SOS cards might be a bit imbalanced: the right card used at the right time can often give you an incredible boost. 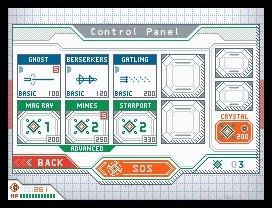 This isn’t necessarily a problem on its own, but Starship Defense can often get very challenging, especially in the later stages, and I often found myself having to replay some earlier stages multiple times just to collect more SOS cards to use to get past some otherwise nearly impossible spots in the latter ones. The game also introduces some environmental ideas, like meteor showers and solar flares, without really doing too much with them, which feels like a missed opportunity. Still, my complaints are minimal next to what is otherwise a very well designed and well polished game. Starship Defense is the very proof of sound gameplay trumping all else. It’s not offering a particularly standout visual or auditory experience, it doesn’t have any extra modes and features, and there are no big gimmicks prepared to draw you in. All that it has is excellent, polished tower defense gameplay that proves to me once again (PixelJunk Monsters being the first time) that Q-Games is at the top of this genre. And it is a meaty game for the asking price of only $5: completing all 30 stages took me about 15 hours. You may have missed it on the DSi the first time around, but if you now find yourself in the possession of one of those fancy 3DS thingamajigs, why not give it a shot? Looking to the future, can we expect to see Q-Games on the 3DS eShop? I sure hope so. Do you think they avoided the black void as to differentiate from something such as Millipede? Thats actually the first (or second) game I thought of when looking at this along with Space Invaders. Those are really kinda the "OG" Tower Defense games in a sense, no? I guess throw in Missile Command, too, and you've got this game in a nutshell..from an outside observer. Anyway, pretty tough to argue with a $5 game. Thats pretty much the price that they can slap on anything and I'll buy it. "Gee, I don't know..how much is it?" "5 bucks." "--oh, ok!" The aesthetics are kind of similar to certain X-Scape levels. Anylord, I started playing this recently, too. Being a TD h8r, I wouldn't have grabbed it unless it was offered through Club Nintendo. And it was! But, yeah, from my limited experience, it's surprisingly good. The mechanics are just arcadey enough to work for me, and there are a lot of nice touches (like physically grabbing the little bits of exploded ships for money). Do you think they avoided the black void as to differentiate from something such as Millipede? Thats actually the first (or second) game I thought of when looking at this along with Space Invaders. Those are really kinda the "OG" Tower Defense games in a sense, no? Not really, because one of the main aspects of the Tower Defense genre is the lack of direct, reflex-based, cause-and-effect control (like, for instance, you shoot -> ship explodes). That's what bugs me about the genre. And about straight RTS, too. Yeah I don't know if I made it clear (my tower defense explanation was pretty brief, I assumed most people knew what they are) but there is no specific ship or anything that you move around, you're basically just placing weapons and then they do their thing. So it's not an "action" game in the traditional sense (like Missile Command and such) where you're specifically flying around shooting things, once you place your weapons they act on their own. You can do little tweaks like shift their aim a bit, but otherwise it's more about the strategy of when and where and what to use. Resource management. I'm not really sure why they made the decision to use the colors they did. There is nothing wrong with it, it's just a bit odd for a space game. I was actually all set to review X-Scape when I realized Guillaume already reviewed it! Which may have been why I bought it to begin with, I don't remember. Anyway, I went with Starship Defense instead. 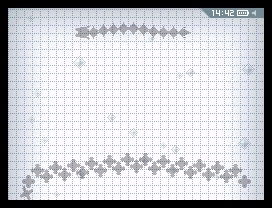 X-Scape is neat too though, another DSiWare gem. Weird.. I'm a huge (HUGE) (HUGE) fan of Ogre Battle, and that is like the Tower Defense version of an RPG. You build your units, you level up your guys, you do Class Changes, you put them together, etc. You tell 'em where to go..but once the battle starts, "away they go." Seems kind of an odd choice for a game, doesn't it? I know that a lot of sports games offer "coach mode" where you call the plays, but the computer does the running/hitting/whatever, but... I dunno, don't people like to PLAY games anymore? For Ogre Battle, the majority of the fun comes with the Class Changes and Unit Management and stuff, so maybe I WOULD enjoy some of this more "passive" gameplay? I've never tried the coach modes because I want to BOWL people over myself. Playing Dragon Warrior III right now, I still get grumpy when somebody doesn't attack somebody they clearly should (especially in the Gambling Pits). RTS games you have total control, right? "You, attack him," and so forth? My friends and I used to simulate games on Earl Weaver Baseball and then watch them play out. We also used to watch the Attract Mode of some C64 wrestling game and 'bet' on the outcome of each simulated match. You have control of your units in RTS games, but you don't directly attack (usually). So you're not shooting people directly. Just coaching your troops. Diablo is kind of the in-between. What is Warcraft II? Thats what I was thinking when I was typing. "MY LIEGE? YES!" "YOUR ORDERS?" Now about RTS in general, you have a bit more control than tower defense games, but I wouldn't say total control. 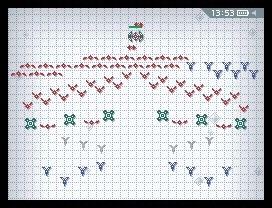 You're generally managing huge swarms of troops so you're kind of relying on the AI a lot. You send say... a tank and 5 infantry up against an enemy stronghold, meanwhile the enemy is attacking your base so you have troops defending it, you might also have a tank guarding a key bridge, and have a harvester collecting resources, jeeps scouting areas, etc. You CAN click on a specific troop and tell them to attack a specific enemy, but you're not really doing that every time. And there are a lot of ways to do "mass" commands, like (on PC) you make a box around a bunch of units with your mouse and now you can issue a command to everyone in the box at once. Stuff like that. I don't think I've ever even played a tower defense game, except for the demo I downloaded of the WiiWare Final Fantasy Crystal Chronicles: My Life as a Darklord, which I didn't enjoy all that much. So I'm not surprised I don't know much about Starship Defense. But I appreciate the review, this game actually sounds like something I would enjoy (and it's from Q-Games)! I like the emphasis on having a nice balance even when the aesthetics may not be anything exceptional. There's definitely a lot of DSiWare games I want to try out, and I may have to consider this one as well. And wow at the length of the game. Yeah, Warcraft II is one of the building blocks of the RTS genre. Dune, too, even though it didn't feature an inflatable Sting. Great review, LOVE Starship Defense! Love the art style too, it's like something I would draw when I was kid, on some graph paper with a sharp No. 2. I know I posted in here before, but now I'm on Review Rush! --That graph paper STILL bothers me. Is there a set pause between waves? Like, are you "allowed" to buy stuff then, or is everything still moving in real-time and you only have 5 seconds to do something while you're waiting? Buying stuff between rounds makes me think of Super Off-Road, and that game is awesome. Sooo..basically this is Super-Off Road: RTS Version? NICE. Reading more, I struggle SO much using the stylus in certain games. I'm horrible at the Balloon Fight deal on NintendoLand, and so many times I just wanted to press press press the buttons to move how I wanted to. Is there a learning curve for stylus stuff, or does it kinda just sort itself out instantly for you since there is no precedent set for that series? Balloon Fight / Joust I've played loads of on Nintendo. Press A to flap wings! When you click the button that brings you to the buying screen everything stops and you have all the time that you need, although once you go back out of the menu everything starts again and you need to place it quickly. There is probably a learning curve for using a stylus in general, but it is fairly straight-forward in this game, although there are the control quirks I mentioned above.